Financial sponsorship for the third planning meeting for CalEON, the California region of the National Ecological Observatory Network (NEON) being developed at the National Science Foundation, will take place on April 22, 2005 on the University of California, Davis campus. Collaboration in design of CBC logo and masthead. Production of links pages for CalEON, the most comprehensive listing of resources for the study of biodiversity, ecology and ecological change currently available on the web. Sponsorship for the 5th CalEON planning meeting at UC Berkeley in November 2006. The Ecological Flora of California (EFCal) is a new component of the Jepson Flora Project that will provide ecological information on the California flora. EFCal will serve as a comprehensive database of ecological characteristics including life history, phenology, morphology and other traits for the California flora. CBC sponsored an advisory board meeting and is collaborating with other funding sources to provide funding to start development of the database. In 2006 CBC provided partial support for 2 months of salary for a post-doc to refine the database architecture and supervise the entry of data sets. Click here for a 2007 report on the results of CBC support. In order to increase the visibility of the UC Berkeley Field Reserves CBC is sponsoring the design and production of a color brochure which will be made available to the reserves for distribution to interested parties and, especially, potential donors. 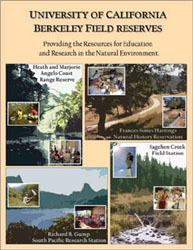 The brochure will highlight the four main field reserves (Angelo, Hastings, Moorea, Sagehen and the Central Sierra Field Research Stations) and will also include sections on the interactions between the Berkeley Natural History Museums and the reserves, on other resources for field research and on how to make donations to the reserves. CBC provided support for a short course on the Morphology, Morphodynamics and Ecology of Mountain Rivers immediately following the American geophysical Union Annual meeting in San Francisco. The course was held on the Berkeley campus and was hosted by NCED (National Center for Earth Surface Dynamics). About 40 students attended.